I was wondering if any members are using or have used layens hives? they caught my attention lately and I really like what I've been reading, but would appreciate the learned experience of others before I'd venture into yet another hive. At the moment I have a mixture of Rose hives and Nationals. I'm running a Deep Long Hive at the moment which is quite close to the Layens 'a grenier' (granary) format, albeit with central frames which are only 12" deep. The colony within it has come through winter without any difficulties. That, unfortunately, is the sum total of my experience thus far with anything approaching a pukka de Layen hive. However, just in case it may be of passing interest to you, I'll briefly mention here something I'm currently working on - which is to some degree based on de Layens' thinking. Emile Warre (in 'Beekeeping for All'), spoke well of the Layens frame format, but wasn't keen on the horizontal format of the hive itself. The A-Z Hive, much favoured by Slovenians and which has been enthusiastically 'discovered' by experimental Americans recently (despite it's complexity and the requirement for uber-precision in manufacture) has, over the years, been enlarged to accommodate two sets of brood frames, one stacked above the other. Whilst understandably pursuing a common frame standard, it seems not to have occurred to anyone to make a double-height frame instead. Doing so would bring the frame dimensions very close to those of de Layens, and at the same time (hopefully) eliminate much of the A-Z hive's existing complexity. So - that's what I'm currently working on. I'll post about progress with this project, if it should be of any interest to anyone. Thanks for that Colin, very interesting and I look forward to further updates. I bumped into another bee keeper that just happened to have built himself the ERB hive, larger again than Layens. He never had any bees in it, however he has agreed to build me one in the next few weeks, so that is something I'm looking forward to receiving, hopefully in time for the swarm season. I still haven't received my Layens hive but am hoping it will be here before the swarms. How are you getting on Colin with your own version? The weather during this winter and spring has been very challenging indeed - fluctuating between Siberian freezing temperatures and extreme heat-waves. Far more weird than usual. One consequence of all this is that most of my colonies were found to be of a pathetic size during the first inspection of the year (although they've all recovered now) - except those on deep frames which had thrived whilst the others had stumbled. The colony in the Layens-style Long Hive was found to be the strongest of all, by a significant margin. So strong in fact that I've selected it for queen-rearing, and have now transferred that colony into a vertical stack in order that I can use a divided Cloake Board. Meanwhile, the hive itself has been moved about 30 feet away, and now holds a former nucleus colony which over-wintered very successfully on five 14"x12" frames. I've moved the blocks to one end, and will now be using this box as a 'Stash Hive' (somewhere in which to hold frames removed from queen-rearing hives for short periods). 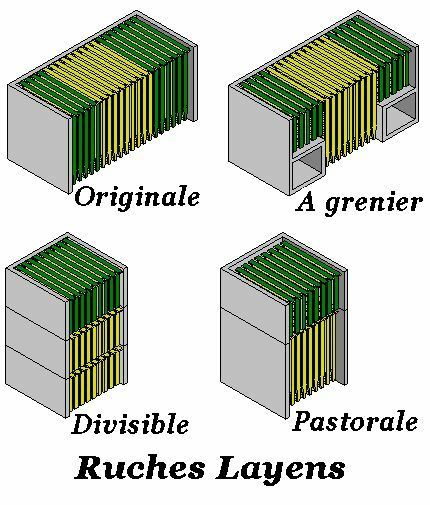 The native Layens Hive was certainly one of the most widespread in France at the beginning of the 20th century. In Spain the Layens hive is still used, mainly for transhumance, especially in the regions of Valenciana, Andalusia and Extremadura. It represents 80% of the Spanish production, it's average annual yield being 17 kg. It's equipped with a hinged roof perfectly adapted for transport. The size of Layens frames is always the same, however the number of frames is typically 12, 14, 16 or 24. Once built, the volume of the hive cannot be increased. The Layens Granary Hive was developed by Jean Hurpin. It is composed of 9 Layens central frames on which the brood develops. On both sides are placed 5 Layens half-frames with center-to-center spacings of 45 mm in which the honeycombs are stored. With such a gap there can be brood in the attics. This hive is ideal for remote apiaries. The attic frames remain in place during the winter period and are therefore always in place at the right time, especially in early honeydew. These hives comprise of a body with 9 or 10 Layens frames, which can contain the 20 kg of honey needed for the over-wintering of a full colony. Over-wintering conditions are ideal, with the heat concentrated within the upper hive body. 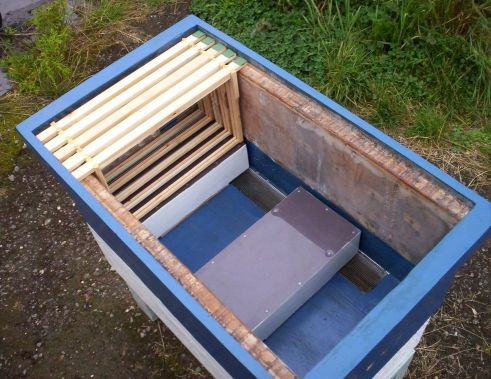 During the honey gathering period, supers containing 8 half-height frames are added above the brood box, these can contain 18 to 20 kg of harvest. Due to the height of the Layens frames, brood is rarely found in the supers, the queen remaining within the lower brood box. The divisible hive format is composed of elements identical to those of the pastoral hive, and has the same qualities of the Layens Hive with the added advantage of being comprised of only one type of element, which simplifies standardization. 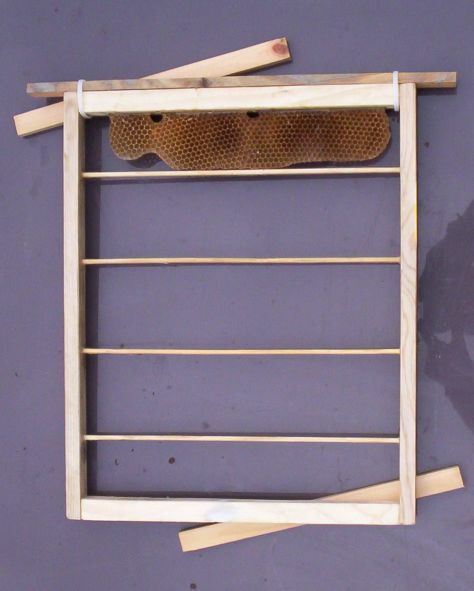 The reduced height of the frames makes their handling easier, and beekeeping procedures can be similar to that of the Warré. I'd really like to work more with the Layens format, but while doing so I'd much prefer to maintain the minimum number of frame sizes within the apiary - and although the 'Pastoral' format appeals to me - I've just realised that a hive very closely matching the 'Divisible' format could easily be formed from two standard National Brood Boxes, each with dummy frames at either end, to then house 9 frames in each box. With two such stacked brood boxes, this would then give a frame equivalent of 33.5cm x 38cm, compared with the Layens' single-frame size of 31cm x 37cm. I reckon that would be close enough to approximate the Layens 'Divisible' format - and the only woodworking required would be to make 4x dummy frames - hardly a major exercise. So - I'll set-up one such hive during this 2018 season. Hope you receive your own Layens Hive soon. Thanks for the in-depth reply, interesting so many variations on a theme! I've since been in contact with my hive maker and its looking like it may well be an ERB Einraumbeute, which is what I had wanted originally. I have a few National bait boxes out at present, no scouts seen and the OSB's are sitting with three tiers, those that made it through the winter are going well, plenty of pollen going in. My losses were heavy at 60%, all still with plenty of stores, bee's just dwindled down to a cup full and succumbed to the cold I suspect. Wondering if it may have been down to poorly mated queens? Strangely my only two surviving hives were OSB's a one tier and a two tier! both mesh floors, the Nationals died out and some of those were strong, and all leaving stores.